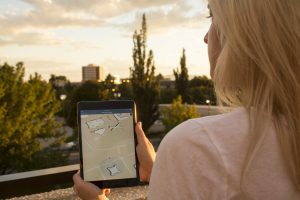 The BYU Mobile App’s useful – and fun – features include a self-guided tour to help students and visitors navigate a changing campus. You’re at a game and don’t know all the words to the “Cougar Song” when everyone around you is rising and shouting. What do you do? With the BYU Alumni Connect feature on the free BYU Mobile App, you can whip out your device and find the music and lyrics. It’s just one feature of a new alumni service that also includes a direct link to the BYU Alumni and Aspen Grove websites, as well as a phone number for the BYU Alumni Relations office. The Alumni Association loves sharing the achievements and stories of BYU grads in BYU Magazine and e-newsletter BYU Today, as well as on our social media sites—and now the app makes it easy for you to chime in. Provide information in the Share an Alumni Story section and we will follow up and find a home for the update. The BYU app also has multiple features designed to help students, employees, and visitors to campus. Need a calendar or directory? Looking for info on housing, parking lots, sports, or Education Week? You can get it here. The app also includes lists and maps of all the restrooms, classes, and vending machines on campus, should you ever find yourself in need. Or if you simply want to explore, try a self-guided walking tour with maps, video narration, and photos.